Superbowl-ing | the little things. January 26, 2009 / April T.
Sorry to offend any football fanatics out there, but I think I’d rather be bowling next Sunday, than have to sit and watch the big game. Well, actually I’d rather be Wii Bowling. I bought my little brother a Wii for Christmas, and now I’m hooked. (Just for the record, I currently hold the high score at 229) and I’d love to throw an awesome party like this one over at Pumpkin Petunia. There is a great write up with lots more photos and tips from this party here. and check out another awesome Wii Bowling party over at Hostess with the Mostess. that is hilarious! i love wii bowling! That is toooo cute!!!!!!! I love it! This is wonderful!! 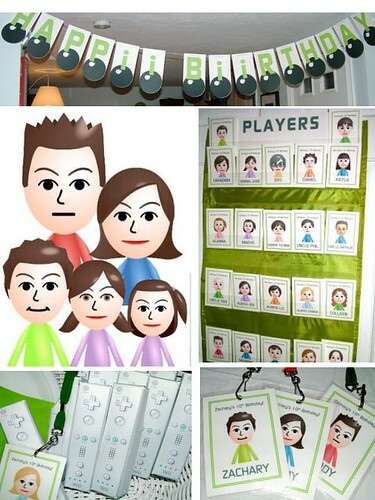 How in the world did you print the Mii’s to create the lanyards? I’ve tried doing a printscreen and it has terrible quality. Thanks!! Were can I print the MII characters, I been trying but no luck at all. My son”s birthday party is the 29 of January.